Rusk, Brian (2012) Cathodoluminescent textures and trace elements in hydrothermal quartz. 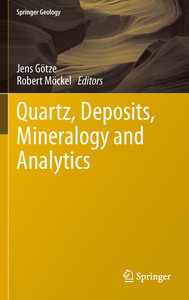 In: Götze, Jens, and Möckel, Robert, (eds.) 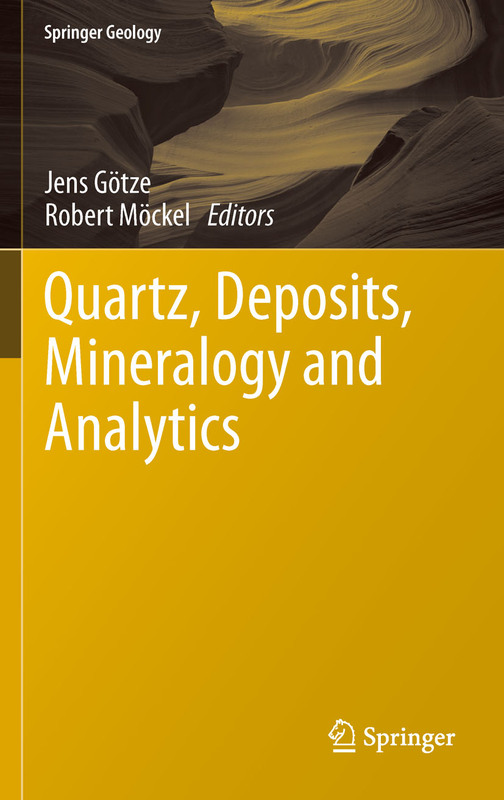 Quartz: deposits, mineralogy and analytics. Springer Geology . Springer, Berlin, Germany, pp. 307-329. When viewed with scanning electron microscope-cathodoluminescence (SEM-CL), hydrothermal vein quartz displays textures that are unobservable using other techniques. These textures provide unique insights into the sequence of quartz precipitation and dissolution events during hydrothermal vein formation. Such textures relate specific quartz generations to specific mineralization events or fluid inclusion populations and may also relate quartz isotopic or trace element data to specific hydrothermal events. The most commonly observed CL textures in hydrothermal quartz include: (1) euhedral growth zones of oscillating CL intensity; (2) chalcedonic, coliform, and spheroidal textures; (3) mosaic textures; (4) CL-dark bands; (5) spider and cobweb texture; (6) rounded cores with overgrowths; (7) microbrecciation; (8) rounded or wavy concentric zonation; and (9) homogeneous (or slightly mottled) texture. These textures are present to varying degrees in quartz from different types of hydrothermal ore deposits depending on the pressure, temperature, or composition of hydrothermal fluids, and the rates and magnitude of fluctuations in these variables. In samples, where the geologic setting of quartz is not clear, CL textures distinguish among quartz derived from epithermal, porphyry-type, and orogenic Au deposits. CL textures result from defects in the quartz lattice, including those caused by trace element concentration variations. Like CL textures, trace element abundance and distribution result from variations in the physical and chemical conditions of quartz precipitation, followed by any subsequent solid-state changes in quartz chemistry. Here we show that CL textures, CL spectra, and trace element concentration vary systematically between quartz from various types of hydrothermal ore deposits. The information derived from quartz analysis can therefore be used to fingerprint the origin of quartz and make some inferences about the pressure, temperature, and fluid compositional changes that accompany hydrothermal quartz precipitation.